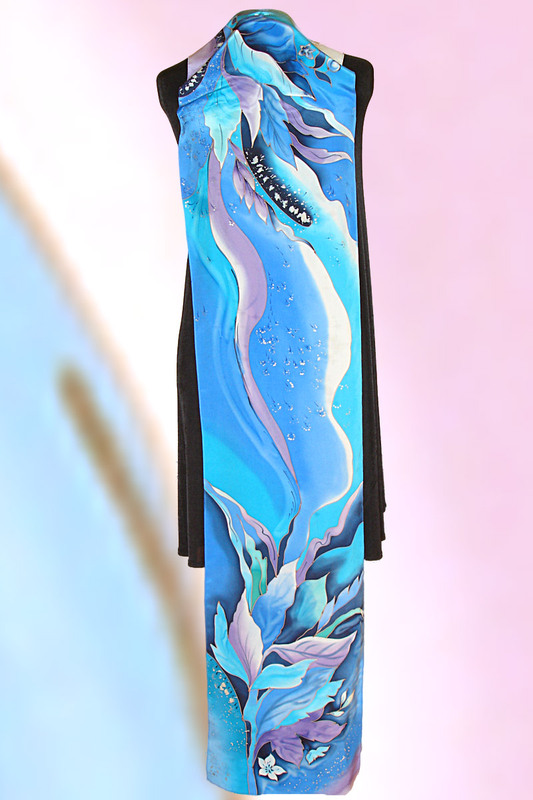 So, the time has come to treat yourself to a women’s scarf or shawl to brighten up your wardrobe and provide that added bit of pizzazz to your outfits. You might have a good idea as to the colors that best suit you and of your preferred designs, but what are you going to do about fabric? Often, when we go shopping for clothes and accessories, fabrics come pretty low on our list of considerations, something which in many ways is a pity when you think about the properties of different kinds of materials and what these can add to or take away from the overall look of an item. Think, for instance, about the difference between a coat made from the finest velvet compared to the same item manufactured from wool or a canvass-type material. While the former would have a look of exquisite luxury and could be worn anywhere, the latter would look far more casual and would have limited wearability. It is not just the look of the item which is affected either, but of course the feel too, and this is equally the case with both clothing and accessories. When it comes to choosing a women’s scarf or shawl, you will, of course, come across a huge variety of examples made from different fabrics. Of these, it is the ones which are produced from the finest 100% pure silk which stand out, and here are just a few good reasons why. 1. The natural properties of silk are such that it adjusts to the body’s own temperature. What this means in effect is that it feels cool against the skin in summer but exceptionally warm in winter. In terms of wearability and value for money, therefore, it is beyond comparison with other fabrics. 2. Unlike manmade fabrics such as nylon, silk does not cling, especially in the heat. The way that silk falls and drapes makes it totally unmistakable in terms of quality. 3. As a natural fabric, silk is 100% hypoallergenic, so anyone with sensitive skin will not have to deal with the embarrassment or discomfort of unsightly, itchy rashes. 4. Silk feels quite unlike any other fabric and is both exquisitely soft and sensual. 5. 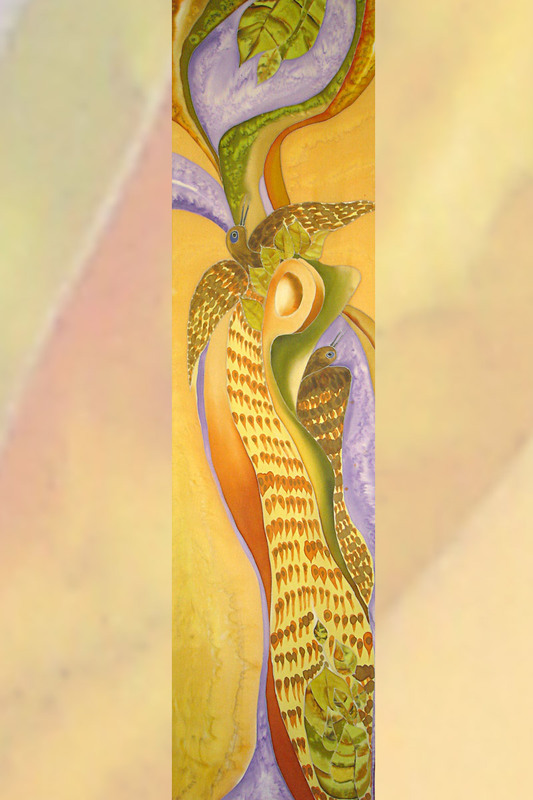 Silk is one of the few fabrics which is used to produce hand painted scarves and hand dyed shawls. 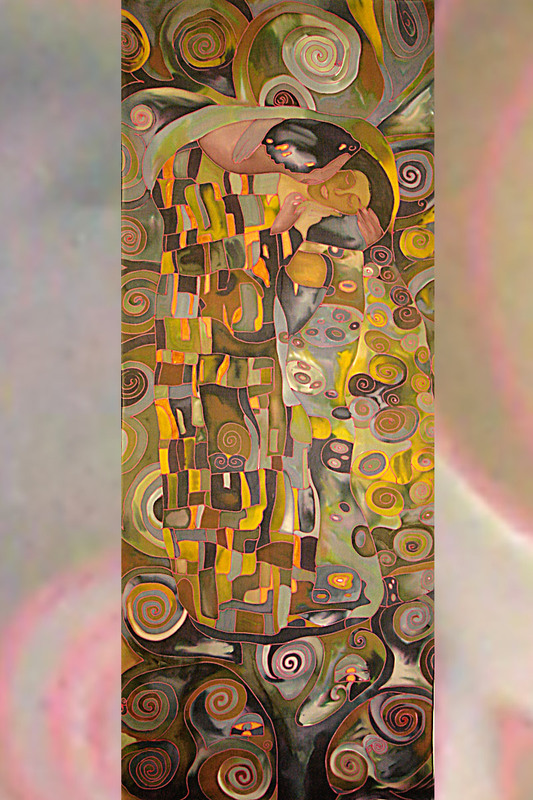 Even designer women’s silk scarves carry printed designs which are introduced into the material as part of a mass-production technique. 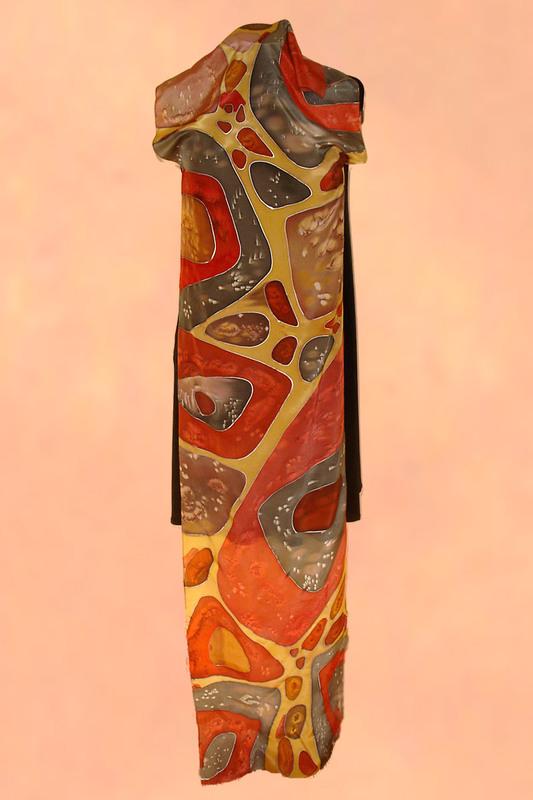 The difference between hand painted scarves and shawls shows immediately in the intensity of the colors, as well as in the texture of the fabric. 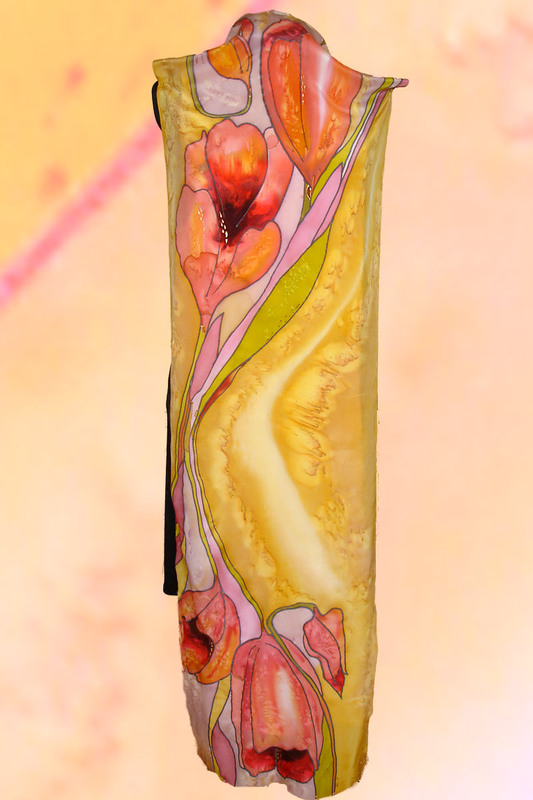 In addition, it is only these hand painted items which incorporate totally unique designs. While cotton is another fabric which is sometimes hand painted or dyed, clearly the quality of this material in terms of look and feel is inferior. 6. Despite appearing fragile and flimsy, silk is very easy to take care of and women’s silk scarves and shawls need nothing more than a gentle hand wash to keep them in tip-top condition. 7. The combined qualities of the fabric give women’s hand painted silk scarves and shawls an overwhelming feel and appearance of class, luxury and style which simply no other material can compete with. 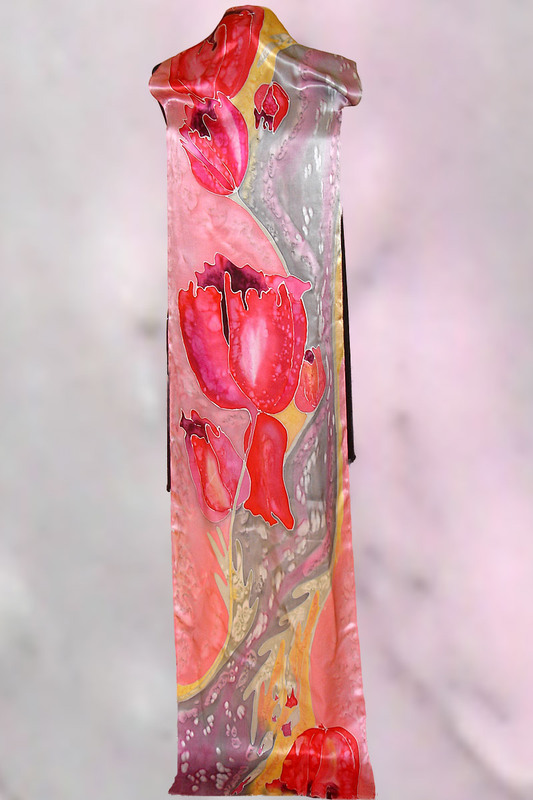 When it comes to choosing your fabulous hand painted silk scarf or hand dyed shawl, obviously you are going to want to select the one which is going to be most flattering in every respect. 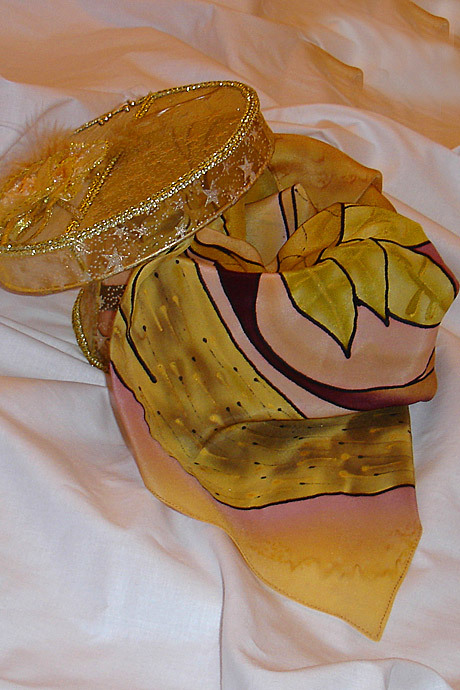 While the gorgeous, floating silk fabric looks stunning on women of all different shapes and sizes and the versatility of these wonderful creations means that you can wear them in whichever way best suits your shape and style, the color though, must be just right for your skin tone for your silk scarf or shawl to have maximum effect. Although some women like to visit a color specialist to find out which shades work particularly well with their skin tone, there are some very simple guidelines that you can follow which do not involve having to pay for this service, and basically these revolve around the four seasons of the year. Simply examine your complexion in the mirror and decide which of the seasons most accurately describes yours. Women who have winter complexions have hair which is at either end of the color spectrum. While some have very dark brown or black hair, others are platinum blonde. Their complexions are considered to be a cool tone with a tinge of pink or blue, and their skin might be pale to porcelain white, a yellowish-olive color or dark. Generally there is a stark contrast between the color of their hair, eyes and skin. Winter people should look for silk scarves and shawls which feature strong, vibrant colors such as red, hot pink, black and navy blue, while beige, orange and gold should all be avoided. Summer people have pale, pink skin and they are often natural blondes or brunettes with light-colored eyes. Again, they have the same pink or blue undertones to their skin but, unlike those with winter complexions, there is usually very little contrast between the color of their hair and eyes and the shade of their skin. The colors which work best for people with summer complexions are the pastels. Baby blue, dusky pink, pale lemon, mauve and lavender are all excellent choices, but bold colors should be avoided as these have the tendency to make the wearer look washed out. Of course, fall is always associated with rich, warm colors and those with a fall complexion have golden undertones to their skin, which might be pale peach, golden beige or golden brown in color. Usually they have red or brunette-colored hair and rich, earthy colors tend to suit them best. Orange, gold, dark brown, beige, olive or even a rich, warm grey all work well for fall people, but pastels, blues, black and white are not at all flattering. Along with fall complexions, spring complexions are also warm. The skin, which is pale ivory in color, has creamy white or peach undertones and people with this type of complexion normally have golden blonde, strawberry blonde or auburn hair and light blue or green eyes. Spring people benefit from being able to wear a great range of different shades from ivory, peach, coral and golden yellow or golden brown, to aqua, bright green, clear blue and true red. So, before choosing your fabulous handmade scarf or shawl, check out your skin tone so that you can select what works best for you and make a truly, stunning personal statement. Although there are numerous ways to wear a silk scarf around the neck, some styles work better for certain occasions than they do for others. Tie it one way and it will look more casual, another and it will give you an air of smart professionalism, and another way still and it will look stunning with an elegant evening gown. Of course, before deciding on how you would like to wear your silk scarf, you need to choose one which is appropriate for the occasion. Although they do come in many different shapes and sizes, the longer ones tend to look much more elegant and sophisticated for evening functions such as cocktail parties, visits to the opera or theater, charity benefits and so on. For a look of real class, the handmade examples which feature unique designs and are painted by hand using special silk dyes are far superior, and of course help you to avoid the potential embarrassment of bumping into someone else who is wearing the same thing. In addition, the 100% silk fabric which is used to produce these stunning accessories drapes and floats in a way which is unmistakable, so everyone will know that you are wearing the very best quality. The very simplest way to wear a long silk scarf with evening attire is simply to drape it around the back of the neck so that the two free ends hang down the front of the body. Alternatively, you could either loop the length of the scarf once around the neck so that the ends hang to the front or, for an extremely elegant look, do the same thing but have the two lengths of fabric reaching down your back. The latter method looks particularly striking with dresses which are cut low at the back, but either method works especially well for women who want to hide any wrinkling on the neck or even unsightly birth marks or scars. 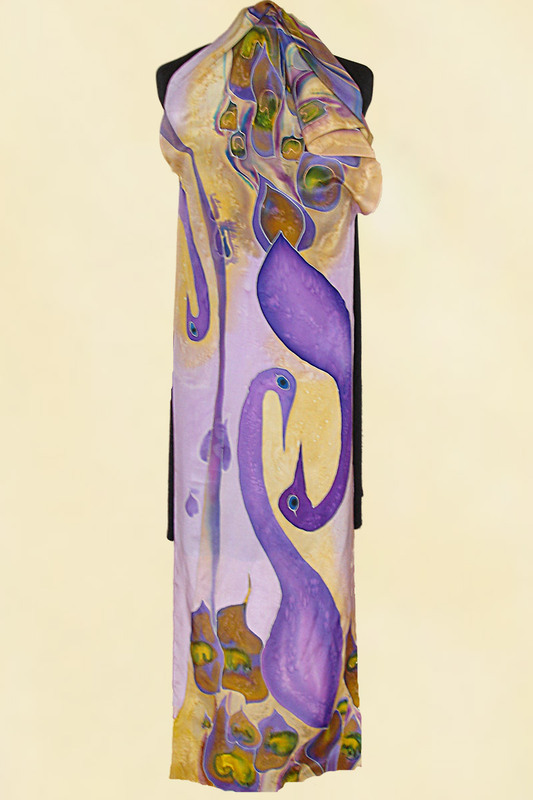 Two other very simple methods of wearing a long scarf involve draping the fabric across the back of the neck so that the ends fall to the front of the body, and then either tossing one end across the opposite shoulder completely so that the fabric sits closely against the front of the neck, or leaving the crossed end lying on the opposite shoulder. For a very sophisticated look which works extremely well for those with long elegant necks, a rosette is an excellent choice. Simply hang a long silk scarf around the back of the neck, allowing the two ends to fall to the front of the body. Twist one end of the fabric over the other again and again to create a rope-like effect, and continue doing this until the fabric starts to double back on itself and moves close up against the neck, sitting slightly off center. When all the fabric has been used up, simply tuck the free ends into the back of the rosette that you have created so that they are not on show. 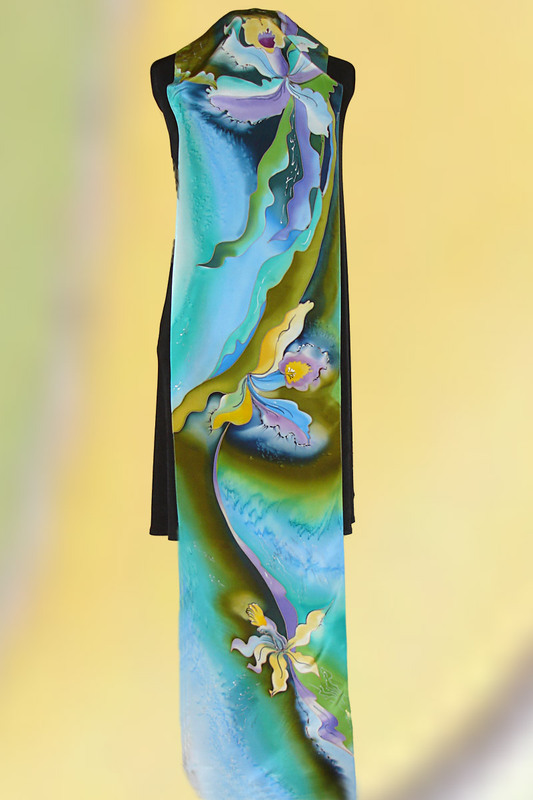 Hand painted silk scarves and hand dyed shawls are some of the most stunning and versatile accessories to find a place in any woman’s closet. 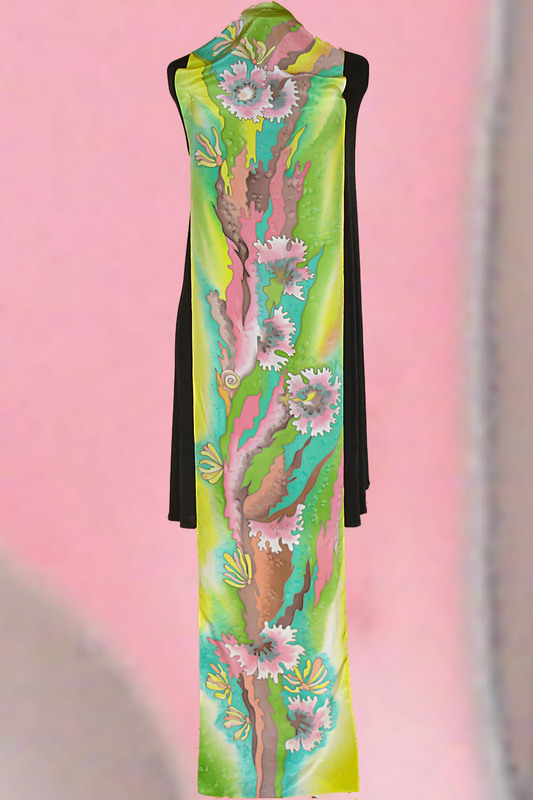 Perfect for bringing that touch of class and elegance to day wear or evening wear, these magnificent pieces are created with all the loving care and attention of talented artists who use a whole palette of colors in their designs. With so many gorgeous ones to choose from though, what is the best way to go about selecting the right color so that your woman’s scarf or shawl gets maximum use? One of the quickest and easiest ways to decide on the predominant color for your handmade scarf or shawl is simply to do an inventory of what is already in your closet. If you open the doors and are faced with a sea of black or white, then finding the perfect accessory to match your existing outfits could not be simpler, because of course almost any color (with the exception of brown and navy blue with black) will either match or contrast superbly with either of these. Strong colors such as reds and oranges make a superb statement against black, while pastels work very well to create a softer look against white, especially for those special summer outfits. Even if your wardrobe is dominated by any other color though, the range of dyes which is used in the production of handmade scarves and shawls is so wide that finding a matching or contrasting shade is very straightforward. Unlike the mass-produced alternatives which typically come in a very limited choice of colors, the handmade examples incorporate more unusual hues which makes color-matching much easier. As well as considering the colors of the outfits in your closet, another thing to do is to check out your collection of accessories. Matching the dominant or background color of your silk scarf or shawl with bags, shoes and belts makes for a really classy, coordinated look in which everything holds together well. Perhaps you have some favorite pieces of jewelry which you like to wear often, in which case you could match the accent color of your scarf or shawl to this. Depending on how you choose to wear your accessory, longer necklaces may, of course, be partially hidden, but matching it to shorter necklaces, ear-rings and bracelets gives a very flattering look. When you look in your closet, you will probably find that most of your outfits have been chosen, although maybe not consciously, with your hair color in mind. Pale pink, baby blue and turquoise all look stunning on women with blonde hair, while mauve and purple work particularly well on red-heads. The stronger, bolder colors, meanwhile, tend to look better on those with dark brown or black hair. With so many beautiful shades to choose from, finding a gorgeous hand painted scarf or handmade shawl to suit your own style, taste and coloring really could not be easier.